We report on victories for Bognor and Pagham under-18s and Avisford under-11s this week – and turn the spotlight on successful seasons for Barnham under-15 and under-nine teams. THE Pebbles’ win over title rivals Burgess Hill put them in control of winning the Ryman Youth League with five games to go. Pebbles took the lead after five minutes with a goal from Rocks first-team player Callum Overton. Five minutes later a silly foul around the box gave Burgess hill the opportunity to deliver a free-kick in the box which wasn’t dealt with and they made it 1-1. Burgess Hill struck next as a direct ball over the back line put a pacy one on one to make it 2-1. But Pebbles levelled when Joe Ashmore hit a 25-yard screamer three minutes before half-time. The second half was nip and tuck and in the 94th minute, a direct ball from Dale Hayes down the line to Ben Mepham saw him squaredit to Tyler Nightingill, who slotted it into the bottom corner. PEBBLES: Mcapline, Heffron, Warren, Hayes, Hawker, Mendoza, Ashmore, Rowlatt, Cody, Stone, Overton, Subs: Awcock, Mepham, Nightengill. Pagham made hard work of seeing off a Worthing side full of fight who were looking to break Pagham’s unbeaten league record. The Lions got the breakthrough on 12 minutes when Nathan Ediker slide the ball home when the visiting keeper dropped it. It took until the 44th minute for the home side’s second, Josh Irish finding time to lob the keeper from the edge of the box. Worthing took the fight to the home side in the second half and on 56 minutes they were awarded a penalty when Jake Greenslade was judged to have man-handled one of their forwards. It was stroked home by Brady Pugsley. The Lion Cubs saw the game out to record all three points. Barnham Trojans Blue are having an excellent season – putting behind them a heartbreaking end to 2013-14. A year ago, they lost in the County Cup semi-final and in the League Cup final – then missed out on the league title on the last day of the season. 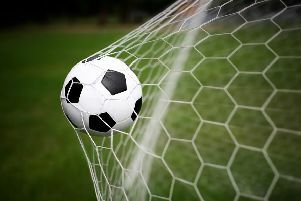 This year, they have worked themselves into a promising position in the Arun & Chichester Youth League A division and their destiny is in their own hands. Team management say the brand of football the lads play is a credit to them and the desire, dedication and work-rate is outstanding. The way they have responded to last season’s disappointment speaks volumes about their strength of character. Coach Dave Fowler has recently stepped down after turning the team in the space of seven years to under-achievers to one of the stronger sides in the county. The team are pictured in their away kit. Back row from left, Alex McCarthy, George Griffiths, Will Newman, Mike Logan, Lewis Blackman, Rhys Voller, Brandon Terry, Danny Sadler, George Roberts; front, Fabio Correia, Callum Fowler, Charlie Williamson (C), Josh Hall, Callum Tite, George Rye, Ben Rose. It’s two wins on the bounce and three games unbeaten for resurgent Avisford. The home side’s new-look four-man back-line snuffed out Town’s attacks effectively. Midway through the half, Avisford took the lead when Charlie Hunter’s shot was fumbled by the keeper and trickled in for Hunter’s tenth goal of the season. Alfie Greene came on as a second-half substitute, and he soon tucked home from close range from Hunter’s pass from the right. A third followed soon after, Sammy Copeland heading in from Greene’s left-sided cross. Soon after Avisford scored a sublime fourth when Matt Kill’s first-time shot from the edge of the area curled beautifully into the top corner. The icing was put on the cake four minutes from time. A pass into the area was spilled by the Worthing keeper and man of the match Jack Dignum put the ball in virtually on the goal line. After a tough season the performances are finally starting to come together for Avisford, this the most complete display yet. AVISFORD: Salter, Hall, Longley, Nowak, Wasowski, Hunter, Copeland, Dignum, Kill. Sub: Greene. Barnham Trojans Blue have had yet another fantastic season. The players thanked their manager for guiding them through the campaign with so much time and effort. They’re all looking forward to the remaining matches and this summer’s tournaments and will be raring to go in their smart new away kit, sponsored by Total Motor Factors, who the boys thanked for their support.